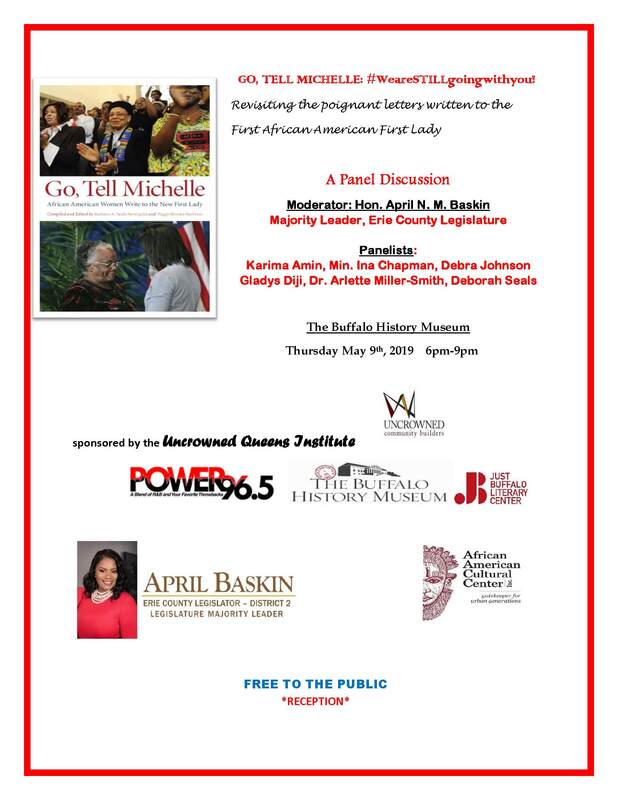 The Uncrowned Queens Institute in partnership with other community organizations proposes to reprise a conversation about the relevancy of the “messages” of “Go, Tell Michelle” in the context of the current social/political environment, including the First Lady’s own publication in which she recounts her own story. What do the messages in these letters communicate that reprise the significance of the Obama presidency and the role of the First Lady, historically, culturally and otherwise. Panel Participants: Local women, who have letters in the volume –Deborah Johnson, Karima Amin, Deborah Seals, Sharon Amos, Arlette Miller-Smith, Ina Chapman, Crystal Peoples-Stokes, Sharon Holley and others including Seals-Nevergold and Brooks-Bertram. Co:sponsored by: Just Buffalo Literary Center, University at Buffalo’s Educational Opportunity Center; Erie County Legislator, April Baskin.